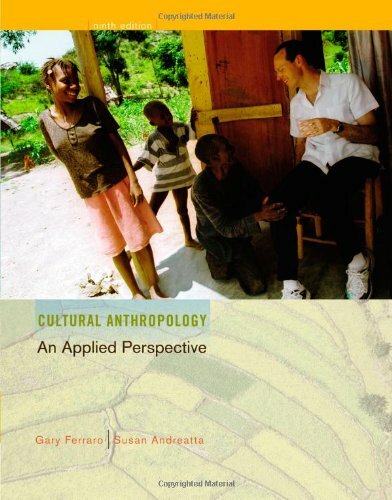 Explore cultural anthropology in an applied and fascinating way with Gary Ferraro and Susan Andreatta?s CULTURAL ANTHROPOLOGY: AN APPLIED PERSPECTIVE, Ninth Edition. This contemporary text gives you all the key material you need for your introductory course, yet is highly relevant to today?s students with its real-world applications of the principles and practices of anthropology. This book will help you learn to appreciate other cultures as well as your own and to apply what you learn to situations in your personal and professional life. Check out the real-life examples of cross-cultural misunderstandings and issues (in popular ?Cross-Cultural Miscues? features) to view ?culture at work.? Also, the book takes a look at specialized vocabularies such as ?chickspeak? (the language of single, urban, upwardly mobile women) and contemporary topics such as health aid for women in Afghanistan and environmental degradation.